For all the Ubuntu users out there, after three alpha and two beta releases, Canonical has finally released Ubuntu 11.04, codenamed Natty Narhwal" today. 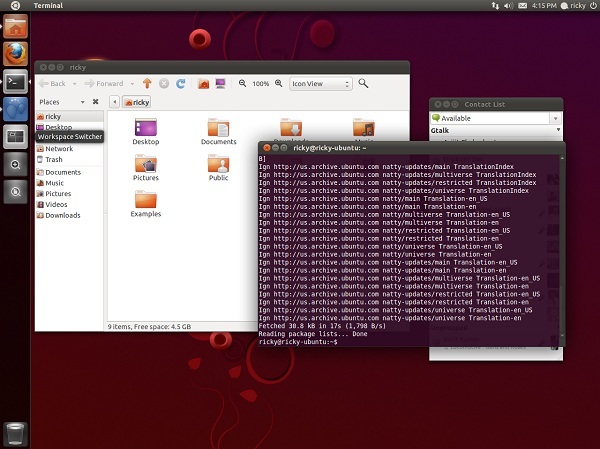 Ubuntu 11.04 is based on Linux kernel 2.6.38.3 and has the much talked about Unity interface. The Unity interface is based on GNOME 3 and built using Compiz. It is a radical departure from the classic GNOME desktop - but after using it for a while, i think that its learning curve is not steep. Users will be able to get a hang of it after using it for some time. Unity did crash a lot during one of Canonical's tests. However, that issue seems to have been fixed now. You might want to check out our list of useful keyboard shortcuts for Unity. If your system is not capable of 3D acceleration, Ubuntu 11.04 will fall back to the default GNOME desktop. However, you can still get some of the Unity experience if you install Unity 2D. The default music player in Ubuntu 11.04 is no longer Rhythmbox. Instead Banshee is now the default music player. Like Rhythmbox, Banshee also supports the integrated sound menu now. For internet browsing, Ubuntu 11.04 comes with the much faster and improved Firefox 4. With this release, there is no separate netbook edition, as the Unity interface has been adopted for the desktop as well. Users who are looking to upgrade from Ubuntu 10.10 do not have to download the alternate CD image. The installation image can also take care of upgrading from Ubuntu 10.10 in this release. If you are using Ubuntu 10.10, you can also upgrade directly from the Update Manager. Open the update manager and it should notify you that an update is available. After installing Ubuntu 11.04, we recommend that you read our post on seven things to do after installing Ubuntu 11.04. The various other derivatives of Ubuntu are also getting their Natty Narwhal release today. The KDE based Kubuntu 11.04 comes with KDE SC 4.6.2. It also includes a fixed printer management tool. Samba file sharing can now be enabled from the files' properties dialog. For those who like a really light weight desktop, Xubuntu 11.04 is available. It uses Xfce 4.8 for its desktop environment and features a new wallpaper and icons.